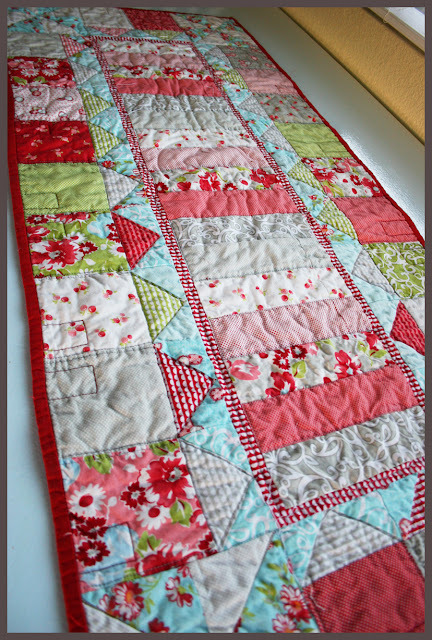 Quilt Story: Fabric Tuesday and Moda Bake Shop! Hey everyone! Today is the last day some of my very good friends are our house and I'm bummed to see them go. We each have two boys the same ages and it's just really fun to get together. They've been staying for five days but it went so fast!! Sad!! Daisy cottage precut fat quarters...I followed on Pinterest, Liked on FB, and I already follow the blog! Heather and I grew up in Colorado on Emerson Street and I have really fond and happy memories growing up there. If you have a minute head on over and check it out! Click here if you need a refresher on the rules. Do you have a fabric WIP? A recent fabric finish? Trying to choose fabrics for a quilt? If it's a post with fabric link it up! I'm a relatively new follower... and I love your blog! Great job on the table topper. It's so pretty! Thanks for hosting...the solar system quilt is one of my favorites that I've made in a while. And maybe this is silly to ask...but I'm kinda new here...would you prefer we only link up quilt-type fabric projects? Or are others okay too...I liked to some Burp Cloths my daughter and I made. Love the Ruby table topper - the houses are so cute!!! 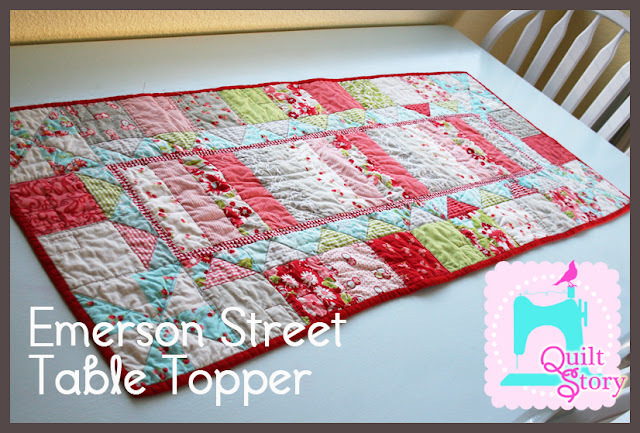 Love your table topper, it's so cute! I really like that table topper, congrats on having it in the Moda bakeshop! That is such a great project on the Bakeshop. Love the springy colors! I love the table topper! I love the little houses on that table runner. Loving Fabric Tuesday! I'm a new, faithful follower! I am LOVING your table topper!! those houses are just too cute and the fabrics are perfect!! I have a jelly roll of that sitting on my shelf mocking me - I better get going! I love your table topper! I am a new follower and have been looking at everything you have made. I just love the rainbow quilts. I love colors!!! Look forward to seeing more of your work. i'm a recent addition to your followers! congrats on the MBS tutorial. looks great! great table topper! love it!